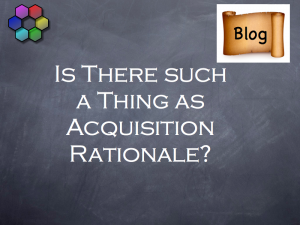 In the first part of this series which you can find here, I introduced the idea that there are Six key factors which can be identified in rationalising Acquisition Strategy. We looked at Ability to Execute and Financial Resources from the perspective of both the Acquiror and the Target companies. In this Part 2 of 3, I want to look in detail at the issues behind Intent from the perspective of the Acquiror. In Part 3 I will look at these issues from the perspective of the Target company. Intent speaks to purpose and has four of the six components of this framework. It is important to appreciate that the two protagonists approach from opposite directions. Let us start with the perspective of the Acquiror. At this point we are challenging the Acquiror to explain WHY he wants to make an acquisition. What will be the benefit to his business – what if you like is HIS rationale for seeking a deal. I have set out six headings below through which to discuss this strategy. The CEO of our acquisitive company may see an acquisition as an opportunity to enhance his product or service offering enabling him to sell more to his existing customer base. 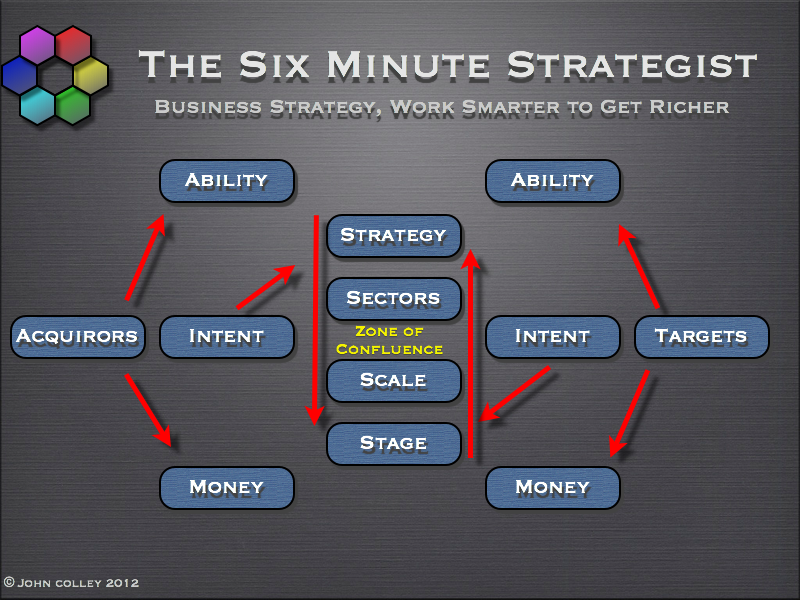 This is generally seen as a low risk business strategy although of course the acquisition itself is not without risk. A deal may give the company access to new markets which may be vertical market sectors or new segments up or down stream from where the company is currently established. These markets may be industry/sector related. The new markets may of course be geographical and provide the company with the opportunity to move from being a regional to a national business or a national to an international business. 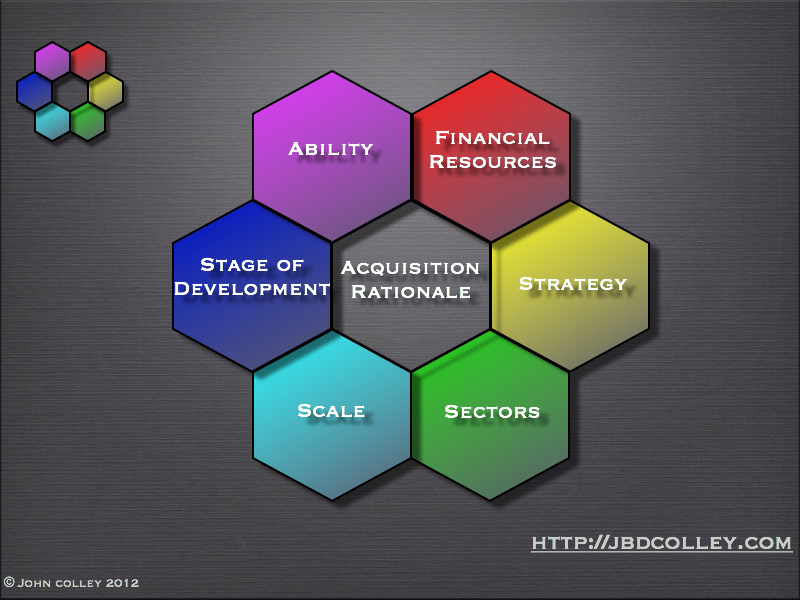 In an environment of scarcity, value is swiftly attributed to resources and this might be the motivation for the deal. These resources might be raw materials in which case the company is making an acquisition to vertically integrate. However, in a technical business the scarce resources might be human – engineers or staff with particular skills or training. The deal may give the acquiror access to additional technology (software or hardware) or intellectual property (patents for example). In a industry consolidation play, the objective of the strategy is to reduce the number of direct competitors and attempt to strengthen the company’s position among the remaining competitors in the market. Finally, the acquiring company may see an acquisition as the most economic means to acquire more customers. In these deals only the assets of the target business may be acquired or, if the whole company is purchased, the bulk of the Target companies operations might be closed down or “rationalised”. The measurement and justification for an acquisition is nearly always summarised in the financial impact, presumably beneficial, that the deal will have on the acquiring company. The term “earnings enhancing” is public company short hand for explaining what can be complex financial numbers in a simple easy to understand way. The focus is normally on the Profit and Loss Account, sometimes on the Cash Flow and rarely on the Balance Sheet which can end up with a large “Goodwill Asset” which has to be amortised over 20 or so years. This is the element of “premium” above the net assets of the Target company that makes up the purchase price of the Target company. What ever the eventual strategic rationale presented, it is important that the company has done its homework and has evaluated its business thoroughly so that this strategy is both credible, practical and realistic. Too often deals are pursued for the simple goal of size or to keep earnings growth ahead of analysts predictions. In those circumstances, the story rarely ends well. This is one of the major defining criteria for target selection. 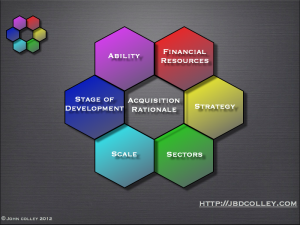 The definition of sectors can become extremely complex and there is no simple or right answer to deliniating them. At the highest level in the Technology Sector, we talk about Technology, Media and Telecoms – TMT. At the next level down, Technology might include horizontal elements following business processes such as; Consulting, IT Services, Managed Services, Business Process Outsourcing, Infrastructure, Software and Hardware. It may include vertical business components such as Security, HR and Management Information Systems. In my view the best way to address the issue of Sectors is to define those around the existing business and any which are adjacent and relevant. Sectors too far away from the exisiting company have no relevance to this particular strategy at this particular time. 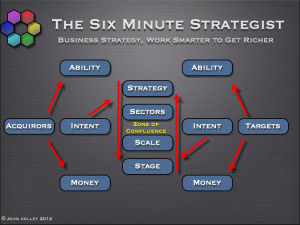 The impact can be described as Tactical, Strategic or Transformational. The impact on the acquiring business will be directly proportional to the size of the Target business to the acquiring business. 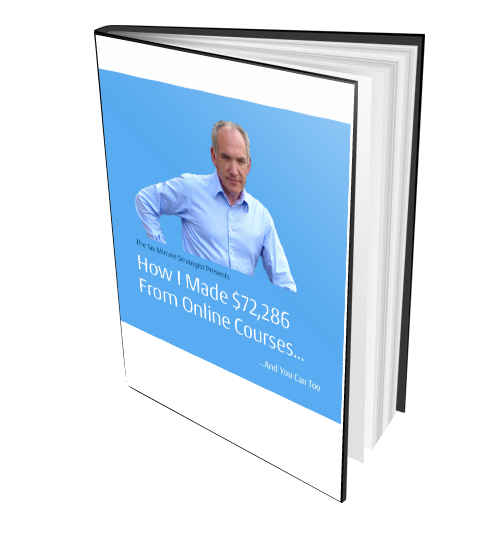 These factors may be financial, geographical, product or service driven or head count. In simple terms however, the ambition of the acquiring management team will be tempered by the resources available to them to make an acquisition and the price they pay – cheap or expensive – for the company they are acquiring. 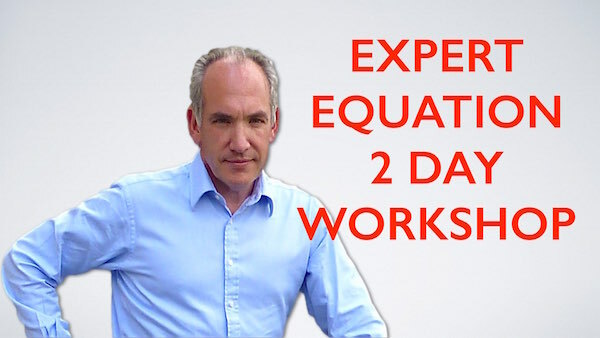 It is important to ensure as an acquiror you negotiate a good deal for your shareholders and the “Earnings Enhancing” argument is frequently wheeled out to defend acquirors pricing and valuation positions. At the end of the day, an acquiror may choose to pay more for a smaller good quality company which is very profitable than acquire a larger, less profitable and lower quality company. You pay your money and take your choice. All companies arguably have a business lifecycle. They are born, they grow, they mature, they decline and at some point they die. In this current era of frantic innovation in technology, of energetic entrepreneurialism and of start ups, the stage that a company has reached in this lifecycle has a direct bearing on its value and the risk of the deal not being successful. In broad terms, earlier stage companies are smaller and might be less expensive but have higher risk. That being said, the value that the founders attribute to the company often bears not direct relationship to its current financial performance as they will argue that the future potential of the business must be included in the valuation. There is a short hand to understanding this better when looking at Venture Capital funded deals. The early stages – Seed, Start Up and Angel rounds normally cover the product or service development and include initial sales to a small number of customers. The first VC round is referred to as an A round and subsequent rounds work their way up the alphabet. One cannot be prescriptive about this but this does help to explain the increase in value of the businesses as their inherent business riskiness reduces. Clearly the later the stage, the better established the business, the greater the demonstrable value and the lower the risk. Acquiring Companies need to evaluate the Stage of Development of a Target business to enable it to clearly understand the value they are buying, the future potential upside and the downside risk in the deal. So to summarise, an Acquiror has a Six Step process to identifying its potential Target Companies which if carried out in the order set out above can explain the rationale behind an acquisition strategy. 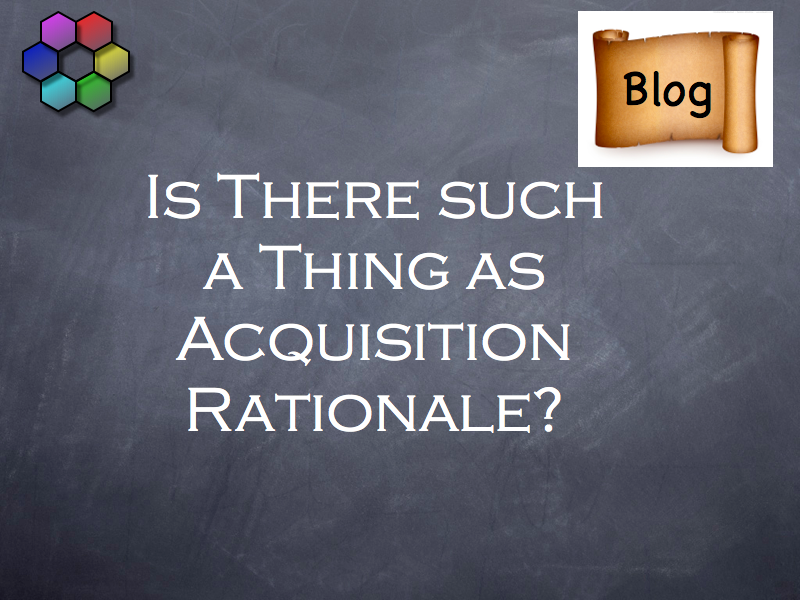 In the next and final part of this series I will look at Acquisition Rationale from the perspective of the Target Company.